If you have visited Tigh Mor in the past you will have seen Ben Venue, a picturesque peak that rises over the southern shore of Loch Katrine. The Trossachs National Park is loved for its wonderfully undulating scenery and the mountains make for great walks if you're up for a bit of a challenge. Ben Venue is by no means the largest in the National Park, it is just under 2,400ft in height (that's not quite high enough to be classed as a munro). However it is still a pretty good workout, taking you probably around two and a half hours to the top. Setting out from Tigh Mor, the walk is reasonably easy going until you reach an old fence line, where it can get a little boggy. At the cairn the path will go left down a smaller track, or continue right to Ben Venue’s summit. It can get a little steep in parts so do make sure you are wearing good walking boots! As you get closer to the top there are two summits; from the slightly lower of the two you'll be able to get a great view of Tigh Mor. 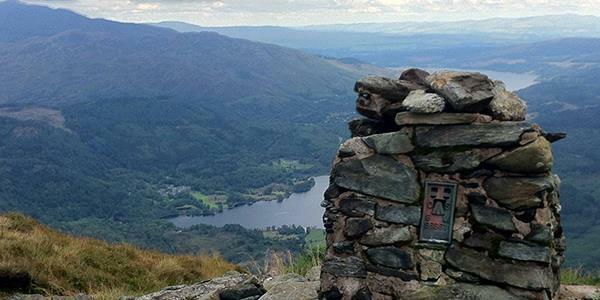 Loch Katrine and Ben Lomond are also visible and both peaks offer different views if you fancy attempting both of them. When you come to descend, it is recommended that you go back the same way that you came up. This one is a great route for wildlife too, and Ben Venue is particularly good for deer, goats and grouse. As you're walking make sure to keep your eyes peeled for the fantastic birdlife that's all around this area. Guests of Tigh Mor often enjoy this particular walk because it tends to be much less busy than a trek up Ben A'an, which is the other nearby peak. For a full step-by-step route guide, take a look here. Alternatively you can take a look at all our other recommended walking routes from Tigh Mor on our walks page. And find out how to stay at Tigh Mor for yourself by simply entering your details at the bottom of the page.